Basal cell carcinoma (BCC) is the most common form of cancer, with about one million new cases estimated in the US each year. Not only is it the most common skin cancer, but it is the most common of all types of cancer. One in four Americans are likely to develop a basal cell carcinoma. Basal cells line the deepest layer of epidermis. The growths are malignant tumors that arise in this layer of skin. BCCs occur most frequently on sun-exposed regions of the body. Although this skin cancer rarely spreads to other organs of the body (i.e., metastasizes), it can cause destruction of surrounding tissue. However, 5–10% of BCCs can be resistant to treatment or be locally aggressive, which damages the skin around them and sometimes invades bone and cartilage beneath. When not treated quickly, they can be difficult to eliminate. Thus early detection and treatment are needed. For more information about Basal Cell Carcinoma or to schedule a consult with Dr. Hurst or Dr. Tate, call our offices in Nacogdoches at Nacogdoches Oral Surgery Office Phone Number 936-569-1111 or Lufkin at Lufkin Oral Surgery Office Phone Number 936-632-4444. Most Basal cell carcinomas are caused by chronic sun exposure, especially in people with fair skin, light hair, and blue, green or grey eyes. In a few instances, there are other contributing factors such as burns, exposure to radiation, arsenical intoxication, and stasis dermatitis of the legs. Basal cell carcinoma may have several different appearances on your skin. 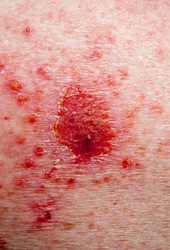 Some warning signs that may indicate basal cell carcinoma are an open sore, a reddish patch, a growth with an elevated border and a central indentation, a bump or nodule and a scar-like area. After a biopsy has been taken and the diagnosis confirmed by a dermatopathologist, treatment is required. Several effective methods are available to treat this tumor. Dr. Hurst or Dr. Tate‘s choice of therapy depends on the size, location and subtype of the basal cell carcinoma encountered. The patient’s age and general health are also taken into consideration. The more common treatment options include excisional surgery, electrosurgery, radiation therapy, and Mohs surgery. For more information, please call our offices in Nacogdoches Nacogdoches Oral Surgery Office Phone Number 936-569-1111 or Lufkin Nacogdoches Office Phone Number 936-569-1111.